Spices aren’t just something to put on bland foods to make them more palatable. It’s true, with spices you can flavor meals without adding fat, sugar, or salt. But it’s probably not the first thing that comes to your mind if were talking about improvement of health. You might be pretty surprised about these 5 incredible health benefits of spices. Most spices are ridiculously cheap and ready to sprinkle on your food. Antioxidants are substances found mostly in fruits and vegetables that protect cells against free radicals. Free radicals are molecules that are produced during your body’s metabolic process. Free radicals damage cell membranes and promote cancerous cells. The antioxidants basically cancel out the effects of the free radicals and eliminate the threat. Cinnamon is very high in antioxidants. Just one teaspoon has as as much as a half cup of blueberries. Oregano has on of the highest antioxidant densities of all the herbs. Some herbs and spices, like turmeric, are cancer fighters. A substance called polyphenol curcumin has proven that it is capable of slowing, or even stopping the growth of cancer causing melanoma cells. It can also prevent other cancers like breast, brain, prostate, and leukemia. Turmeric is an Indian spice that goes really well with rice. Some other cancer fighting herbs and spices are rosemary and paprika. Paprika has a substance called capsaicin that is an anti-inflammatory and it also has antioxidant effects. This substance is also found in cayenne paper and chili peppers. Inflammation is known to be a precursor for many chronic diseases including heart disease, allergies, and others. Garlic, parsley, nutmeg, and ginger are just a few spices that assist in healing body inflammation. Over one third of Americans have high blood pressure which stresses the heart and promotes heart disease. The U.S. Department of Health recommends that no one intakes more than 2,300 milligrams of salt. That number drops to 1,500 milligrams for people over 50, African Americans, people with hypertension or diabetes. A spice called cardamom has been found to reduce blood pressure and increase antioxidant levels. It’s smart to replace the table salt with spices to give your food flavor. That will decrease your sodium intake and significantly reduce your risk for heart disease and high blood pressure. 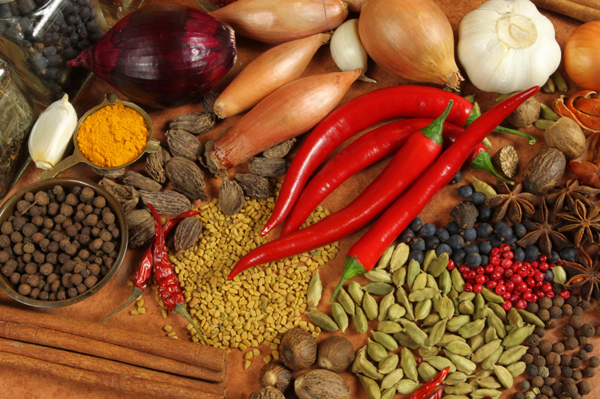 Research suggests that some spices, like spicy peppers can boost your metabolism and promote the feeling of fullness. That means you will burn more calories and also eat less at the same time. A compound called dihydrocapsiate in spicy peppers promotes the burning of fat for energy if you eat it multiple times daily. I hope these 5 incredible health benefits of spices have convinced you to experiment with different seasonings in the kitchen. Your food will taste way better without all the salt, sugar, and calorie packed sauces. You may also be interested in The Silent Epidemic Of Salt Consumption. Also, you might want to take a look at 12 Unbelievable Health Advantages Of Lemons.